-Vampires unite! 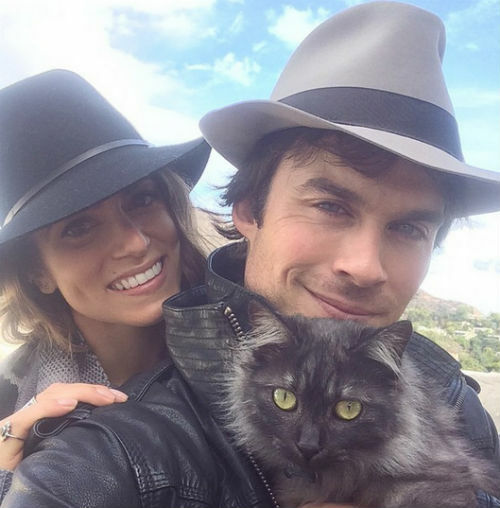 After just six months of dating, Ian Somerhalder and Nikki Reed are already engaged. -Speaking of late-night antics, on Kimmel last night Sir Patrick Stewart perfectly demonstrated the most annoying people on planes, and Jessica Chastain made a fake gum commercial. -Well, that didn’t last long. Rosie Perez is reportedly out as a co-host of The View. -Wait, Miley Cyrus and her brother are both dating Schwarzenegger siblings? That’s a reality show waiting to happen. -Well, this might be the least-watched Oscars ever judging by today’s nominations, which eschewed blockbusters for indie fare. And white dudes. So. Many. White. Dudes. There were lots of big names unexpectedly left off the list (the ones that hurt me the most were Jake Gyllenhaal, Ava DuVernay, David Oyelowo, Nick Hornby, and Gillian Flynn) but on the plus side, we don’t have to add the words “Oscar nominee” before Jennifer Aniston’s name! I saw Two Nights, One Day last night and Marion Cotillard definitely deserved that slot. -This is cute: Ethan Hawke says he’s helping his Boyhood movie kids navigate Oscar season. –Emma Stone’s reaction to her Oscar nomination made me love her even more. –Tom Hardy dropped out of playing Rick Flag in the upcoming Suicide Squad movie, and rumour has it that Jake Gyllenhaal is set to replace him. –Mariah Carey is finally getting her own Vegas residency. I’m amazed it took her this long. -One of the actresses from Reign just launched a feminist website celebrating women’s sexuality, and it’s surprisingly great. –John Travolta must have really wanted to hook up with this guy at the gym if he let him take a photo of him without his hairpiece. -Here’s the first trailer for Anarchy, starring Ethan Hawke, Penn Badgley, Dakota Johnson and Ed Harris, who is apparently in every new movie trailer this week.